This year, my mom and sisters drove down to Wichita to celebrate Mother's Day. It was sooooo nice to have them here. We decided that we would all particpate in the First Annual Girls on the Run, Mother's Day 5K. There was an awesome turnout..almost 1000 participants! 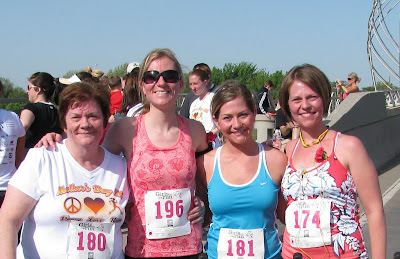 Kathleen and I ran the 5k, while Mom and Kristen pushed the kids in a couple strollers. I think Kathleen and I got the better end of the deal!!! Mom pushed Ela in one stroller...and Kristen pushed Jak and Eva in another stroller. Kristen was definitely a trooper...she pushed an extra 75lbs for 3.1 miles!!!!!!!!!!!!!!!! We all were so proud of ourselves for actually finishing the race. I finished in 207th place with a time of 30.36 min and Kathleen finished in 307th place with a time of 33.19 min. Mom and Kristen finished in just under an hour at 56 min. Not too shabby!! MOM AND KRISTEN FINISHING STRONG! !